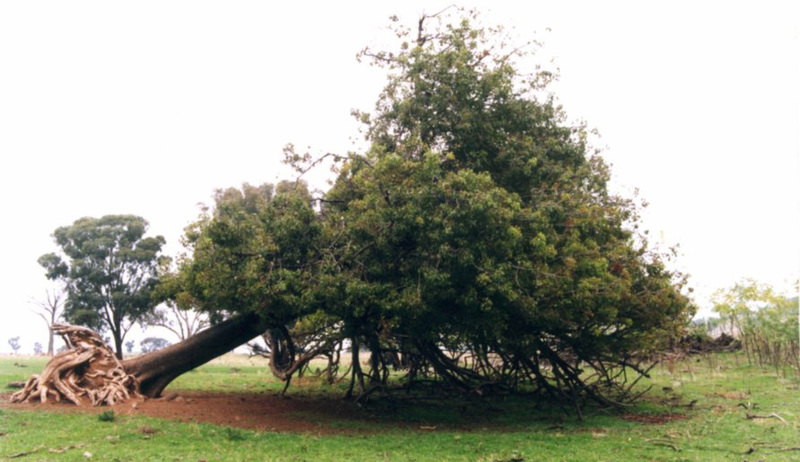 A kurrajong tree (Brachychiton populneum) struggles to survive near a house site on Portion 99. These trees provided feed in time of drought and are sure markers of historical settlement. 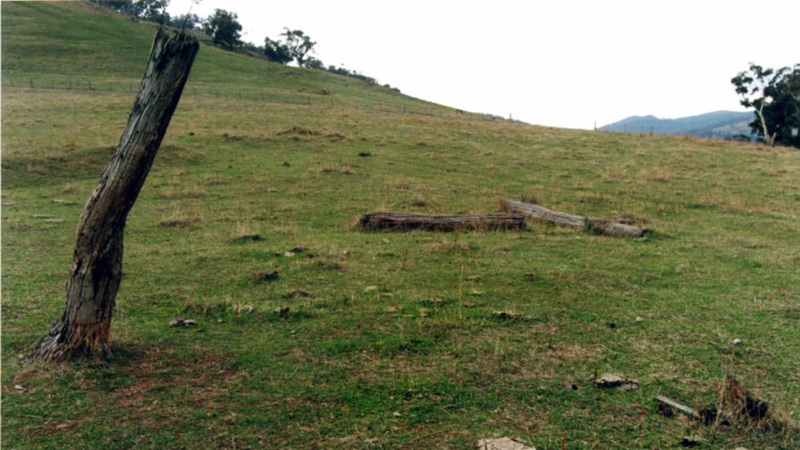 The task was to assess whether there were any heritage items in 8.5 square kilometres of pasture and woodland on hilly terrain in Western NSW, on a property called “Tunbridge Wells”. There were no heritage listings, only some historic mine workings. But were there any historic farm or buildings sites? The problem was solved using title search and a time saving approach to site survey. The land was purchased mostly under Conditional Purchase using sections 13 and 21 of the Crown Land Alienation Act of 1861. There were eight original individual purchasers. As a primary hypothesis, it was assumed that there would be one house for each landholding or each group of portions. As land was progressively amalgamated, homesteads would be abandoned, until the whole of the property was run from a single home site. By following this process of amalgamation we could predict where we should find a farm as well as its probable date range. The original farms ranged from single parish portions to groups of portions. The plan shows the date each farm came into existence. The four northern farms were amalgamated in 1891, the southern 4 farms in 1906. It was not until 1911 that these large landholdings were joined together, the whole farm being finally consolidated by land purchases in 1937. The title search was no ordinary task, but required research of the archives relating to conditional purchase, prior to issue of title deeds. Portion plans often revealed improvements, including the sites of huts. Finally, with the help of the modern landholders, we filled in the final gaps during site survey and located all the house sites. The success of this technique depended on thorough research and preparation, prior to site survey. This approach meant we did not have to survey all the properties, but could focus on the house sites and other improvements. The results provided certainty that we had recovered all the farm sites and enabled us to make recommendations with confidence. 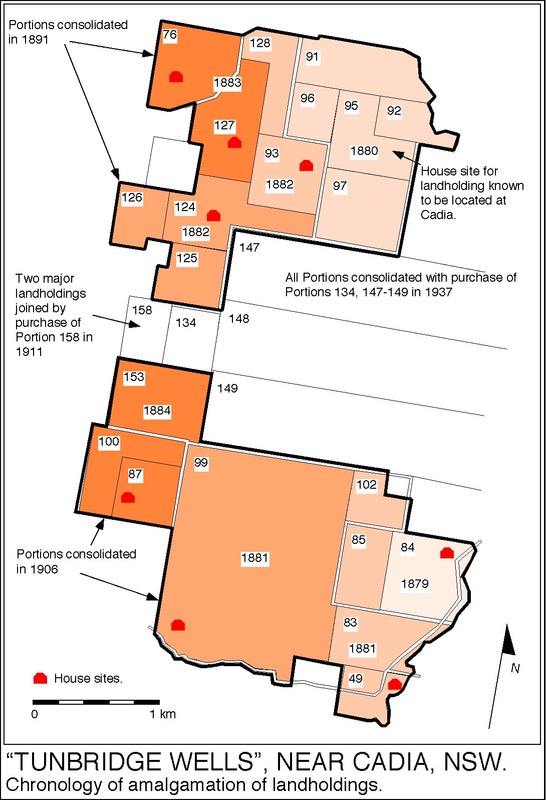 The research revealed the pattern of settlement on the land from the 1870s onwards, the amalgamation of portions into larger and more viable properties, mostly running sheep (shearing sheds). This process has also resulted in the depopulation of the bush. It is often surprising to see just how many families lived in semi isolation on these rural blocks in the past. They were settled by the generation, who sent their sons to World War 1. Some may ask why these isolated farm sites are significant. They were obviously a widespread feature of the historic landscape. Recent excavation of the buildings on Portion 84 revealed the site of a selector’s hut as well as Tynan’s slaughterhouse, which supplied Cadia Village (now abandoned) with fresh meat. From the archaeological evidence provided by the remains of the hut and its rubbish dump we can see the struggles of those, who were attempting to make the transition from wage employment to a life on the land. The attempt was not always successful, as witnessed by the sale or loss of many farms, to be amalgamated into the larger and more viable holdings of today. Edward Higginbotham & Associates Pty Ltd. Historical and archaeological assessment of the Cadia Ridgeway Project on 'Tunbridge Wells', Four Mile Creek Road, near Orange, N.S.W. Resource Strategies Pty Ltd. 1998. Edward Higginbotham & Associates Pty Ltd. Report on the archaeological excavation of Tynan's Slaughterhouse, Old Cadia Road, Cadia, NSW. Cadia Holdings Pty Limited. 2001. The historical research for these reports was undertaken by Terry Kass. The site of Tynan’s slaughterhouse was marked by one standing post, the others fallen. In the background a mound of soil marks the fireplace of a selector’s hut. These unprepossessing farm buildings, the shearing sheds so common in the Central West, indicate the importance of sheep and wool to the local economy, right up to the present day. (The shearing shed, “Tunbridge Wells").